The Gatehouse Hickstead velvet riding hat is a deluxe finished, stylish velvet riding hat with Airflow lining. This velvet covered peaked riding hat features professional luxury flesh colour pittard's leather 4 point harness with easi-fix hook and lace adjustment at the rear. 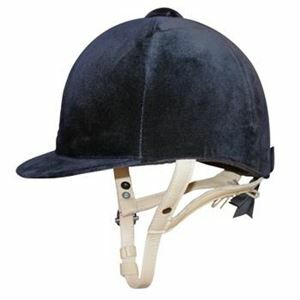 Te Gatehouse Hickstead velevt riding hat is an extremely comfortable, professional hat. This Gatehouse riding hat is fully kite marked hat with the BSEN 1384 Standard.